As it is known to us, Windows 10 has a lot of cool features, but some features are no longer available such as Windows Media Center, DVD Playback and Windows DVD Maker. So you might encounter some problems when you would like to create DVD fast with some tools, while there is no Windows 10 DVD Maker. But it doesn’t matter since there is some other effective DVD maker software for Windows 10 that can be really helpful. Talking about DVD maker for Windows 10, top Windows 10 DVD Maker software is offered here. Follow the tips here and you can burn DVD on Windows 10 Computer with the help of DVD maker software as easily as possible even if you are a totally green hand. 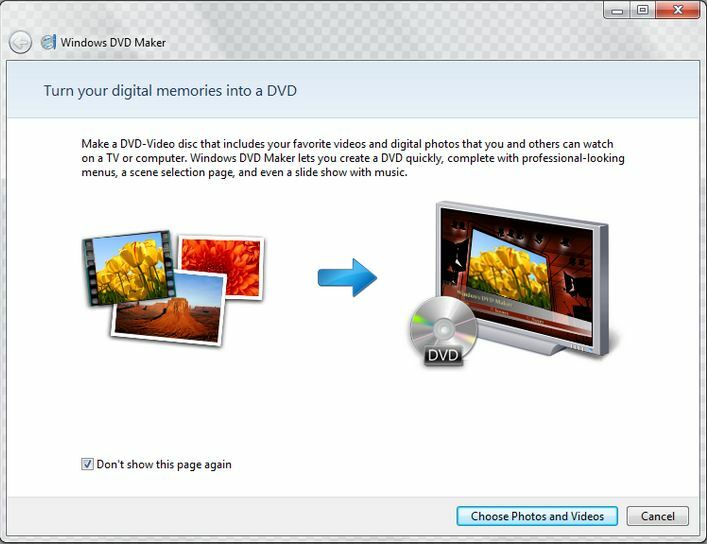 Leawo DVD Creator is a powerful Windows DVD maker program, which is professional in converting video to DVD. Moreover, it supports 180 formats of Videos like AVI, MKV, MP4, WMV, Xvid, MOV, and FLV etc. Besides, this program makes DVD burning enjoyable since there are 40 beautiful DVD menu templates for you to customize your design. Undoubtedly, Leawo DVD Creator would be one of the best Windows 10 DVD maker software. Since it works fast in simple steps and you can burn DVD on Windows 10 computer very soon. At first, you are able to make DVD in Windows Media Player which is a free DVD maker for Windows 10. Windows Media Player works great in playing video and audio files in WAV, AVI, MPEG-1, MPEG-2, DVD, MP3, WMA, etc. Besides, it can also support users to burn DVD on Windows 10 Computer. You can just follow the steps here. Step 1: Open Windows Media Player in your Windows 10 computer and click the Burn tab. Step 2: Insert a blank disc into the DVD driver and select a format (Data CD/DVD or Audio CD) you want to burn by clicking Burn options. 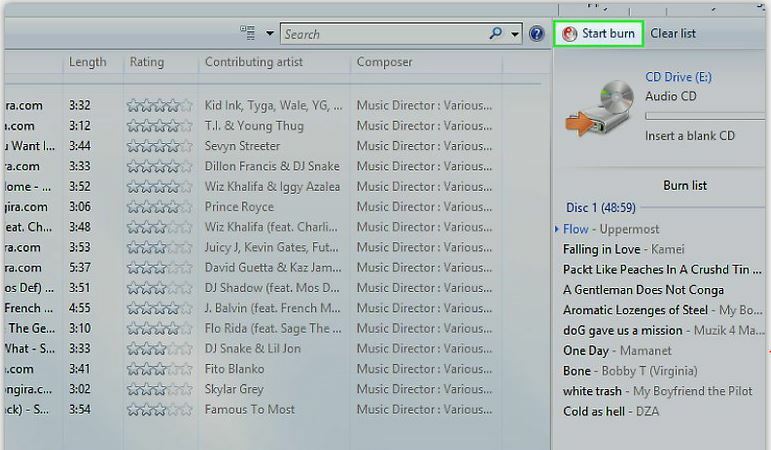 Step 3: Drag the video/audio files from the Player Library to the list panel to create a burn list. 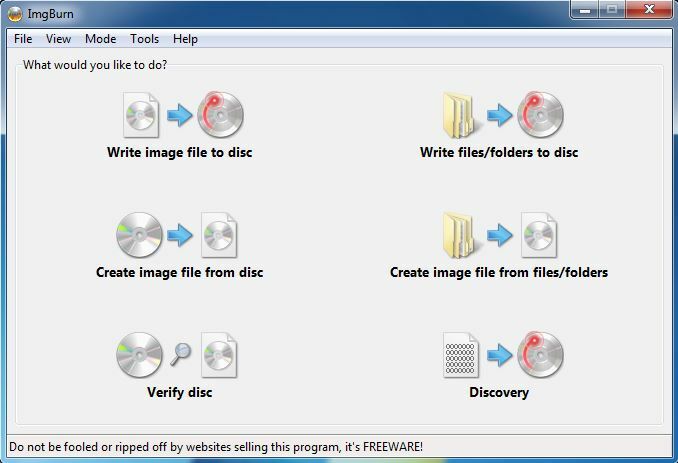 Step 4: Click “Start Burn” and the program will immediately begin to burn DVD on Windows 10 Computer. It will soon finish the burning. Then you can get your favorite movies or songs in the DVD. However, you should be informed that Windows Media Player is free DVD burning software which cannot work for the video or audio files in the format it cannot support and you cannot customize the DVD neither. Sothink Free Movie DVD Maker is a popular and free program which can burn nearly all sorts of videos into DVD, including the downloaded videos, camcorder videos, and any other videos with almost different kinds of formats. And it works for Windows Vista,Windows 7, Windows 8, Windows 8.1 and Windows 10. It’s one of the top Windows 10 DVD Maker software that can help you burn DVD. 1. Burn DVD videos from all common video formats like MP4, AVI, MKV, FLV, WMV, MOV, 3GP, M4V, TS, M2TS and so on. 2. Customize the DVD menu flexibly with various options. 3. Fast speed in DVD creating and Available playback customization. ImgBurn, as free and helpful Windows 10 DVD Maker software, is especially developed to burn DVD as well as CD and Blu-Ray. Moreover, it works for all the Microsoft Windows OS, from the Windows 95 to Windows 10, and it even supports Linux. With the help of this free DVD burning software, you can easily get to burn files to DVD in Windows 10. Besides, it also has some good features. 1. ImgBurn Windows 10 DVD maker software supports all the latest drives. 2. 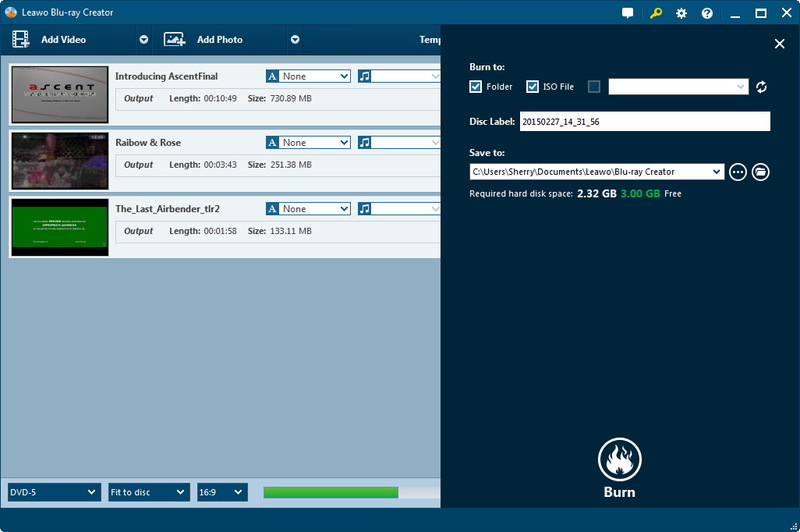 ImgBurn supports many image formats including BIN, CCD, CDI, etc., audio formats including AAC, APE, FLAC, M4A, MP3, and many other video formats as well. 3. Create image files on computer and burn them using ImgBurn. Windows DVD Maker is also free DVD burning software which is compatible with Windows XP, Windows 7, Windows 8, Windows 10 and Windows Vista. What’s more, with Windows DVD Maker, you can create a DVD from almost 60 formats like AVI, MP4, WMV, FLV, etc. You can burn DVD on Windows 10 Computer using this software and make sure its features. 1. It can burn files to DVD Windows in 60 video formats including AVI, MP4, WMV etc. 2. It allows you to convert the video files to other formats. 3. It can customize the video file in DVD subtitles and menus. As one of the greatest software to burn DVD on Windows 10, Leawo DVD Creator would be your best choice for you to burn DVD since it works in high speed and keeps the output files in high quality in DVD. You can download the program and install it. Then start it and just follow the steps here. Note that you should insert a blank DVD before you start to burn files to DVD Windows 10. Click “Add Video” to import the videos or you can just drag and drop the videos to the creator directly. 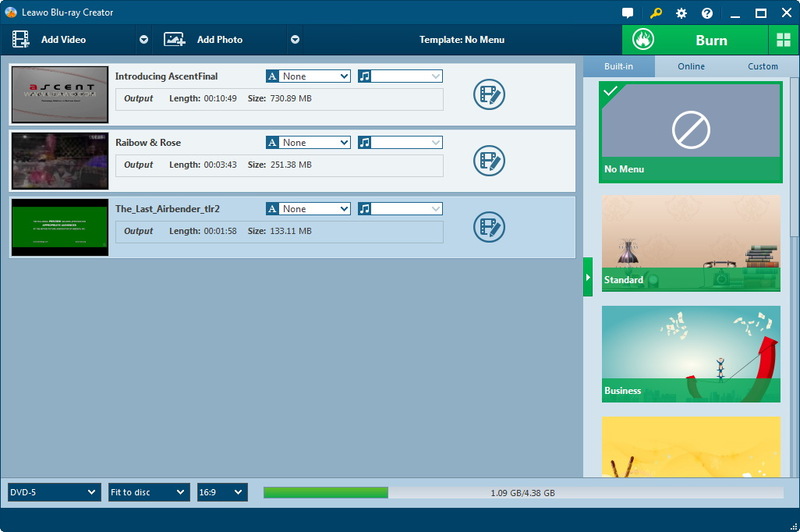 In the right sidebar, there are multiple preset disc menu templates in different themes, such as Standard, Business, Education, Childhood, Holiday, etc. Besides, DIY disc menu with your own images and audios is also available. Click the big green “Burn” button, and then the sidebar of burning settings panel will pop up, where you need to figure out Burn to, Disc Label, and Save to options. Click the “Burn” button on the sidebar, and the burning process will be started and finished in a few minutes. Anyway, it is quite easy to burn DVD with free DVD maker for Windows 10. With the help of Leawo DVD Creator, you have got your DVD and you will keep your beloved videos safe. Whatever, you have known how to burn DVD on Windows 10 computer, and you can choose the proper way you prefer to burn files to DVD Windows 10.